Marcia and Grey interview Mike Splain in the Ventana Wilderness Alliance office in downtown Santa Cruz, California. A native of Maryland, Mike Splain relocated to California in the 1990s and has since pursued wild lands conservation as a supporter, volunteer or staff member for various advocacy organizations, including Forests Forever, Sierra Club and the California Native Plant Society. He holds a BS in Ecology and Evolutionary Biology from the University of California, Santa Cruz and currently serves as Wilderness Chair of the Sierra Club, Ventana Chapter. 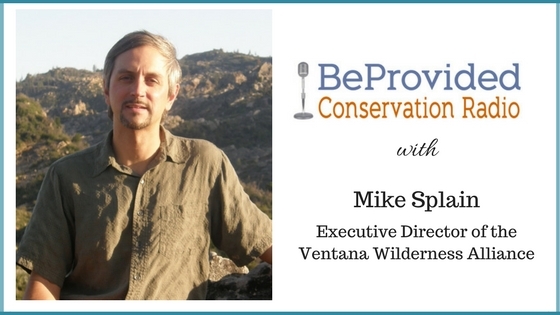 Mike began volunteering with the Ventana Wilderness Alliance in 2003 and became the organization’s second Executive Director in 2012. He lives with his wife Gabrielle and dog Pepper in the mixed evergreen forest of Bonny Doon, CA.